Oh, hi! I'm Elin. It's really pawsome you're reading this just because you want to learn more about me! It's great I have your attention, because I really want to find a home! Unlike some of the other of the adoptables at the All About Cats rescue, I wasn't a stray wandering the streets. I wasn't given up because my family was moving away. I used to have a home. I used to live a perfectly happy life with a perfectly pawsome owner and a lot of perfectly pawsome kitty siblings...but then there was a house fire and my owner perished. Me and a few of my kitty comrades survived and now we're here, waiting for the day we can be back in a home where we live normal lives. 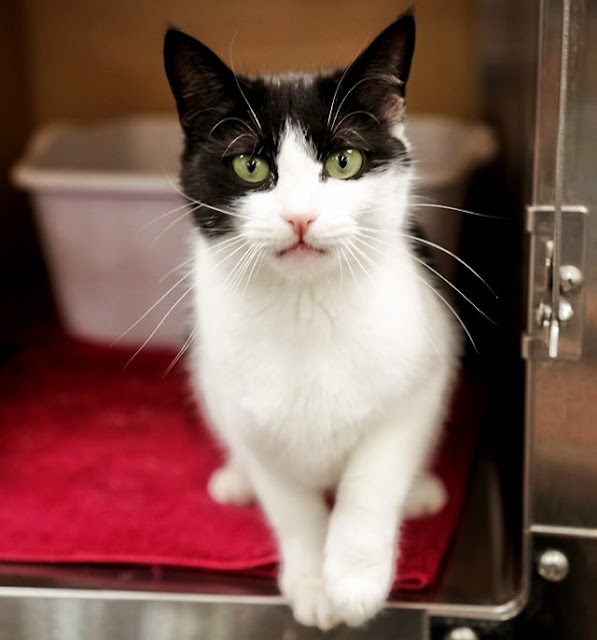 I'm a little nervous because of the tragic incident, but I am a young, friendly girl who will gladly accept your affection and absorb all of your attention! I'm curious, fun, and beautiful, if I do say so myself. What's not to like? If you want to take me home, click HERE to fill out an application! If you can't, no biggie. Just click HERE to donate to the All About Cats rescue so they can help more cats like me! If you aren't able to do that either, click HERE to browse the pawsome All About Cats website! I'm waiting for someone to come by and look into my eyes and realize they've been looking for me all their life...are you that someone? We hope you get adopted TODAY! Happy Earth Day! What a pretty kitty face! Hope she finds a good home real soon! We hope you find a home soon Elin, we are very sorry about the house fire. It must be really hard losing your home and your purrson. We are crossing our paws for you and sharing this post.